Our 8 hour course is designed to teach dog owners and dog professionals the knowledge and skills to respond to a sick or injured dog. ​118 page course manual included. Our one-of-a-kind 3 hour workshop trains you how to respond as a lost dog investigator. We'll make effective flyers and posters plus our Operation Find Fido™ Handbook is included. Our 2 1/2 hour follow-up workshop is dog-friendly and you'll practice your new skills learned in Dogsafe 101 but on your own dog while under the supervision of your Dogsafe Authorized Instructor. Our customized Dogsafe for dog*tec is a four hour workshop designed specifically for the canine first aid component of the dog*tec Dog Walking Academy. Our Dogsafe 101 student manual is included. It was a challenge to design an online program that would maintain our high standards -- but we did it -- and now you can learn in your pajamas with your dog at your feet. Available worldwide. Do you have an entire staff that need training? A group of clients that want to learn canine first aid? Do you have a professional canine program and want to add a canine first aid component? Michelle, I want to thank you personally and say how glad I am that our companies are working together. Why Should All Dog Professionals Enroll in Dogsafe®? Dog professionals, including breeders, groomers, dog sitters, dog walkers, dog daycare operators, trainers, retail store staff and kennel and shelter staff, need to be prepared for emergencies involving dogs in their care and on their premises. Are you concerned about your legal responsibility for the dogs in your care? Most dog professionals provide clients with waivers to sign before taking dogs into their care. However, waivers do not protect you against negligence. If you have not provided adequate canine first aid and safety training to yourself and your staff, or have an emergency action plan in place, you may be considered negligent if something should happen to a dog in your care. Dogsafe can help by training your entire staff. Have you thought about your business reputation if a dog becomes lost, injured or dies while in your care? You probably started your business because you love dogs and we know you would want to do the best for them. You have also worked hard to build your business and your reputation can be crushed in a second if you are portrayed negatively during word of mouth conversations, or worse, in the media. Imagine the difference of public opinion if you confidently state your positive actions in response to losing a dog or an accident (they happen!) versus a wavering, ineffective response that points to negligence. 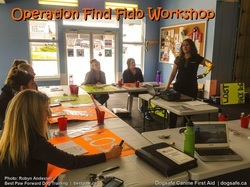 Dogsafe Canine First Aid courses and Operation Find Fido™ workshops can provide the confidence you need to act positively in any emergency involving a client's dog. Do you want the absolute best for the dogs in your care? We share your enthusiasm! You take pride in your business and Dogsafe wants to help you provide the best possible care you can for your clients. Dogsafe courses will teach you everything you need to know to confidently deal with any emergency involving a dog. As a business owner, you won't have to worry about the "what if" anymore -- Dogsafe will give you peace of mind. What an amazing course! I learned tons and definitely recommend the Dogsafe Canine First Aid 101 course. Do you have a new or existing business with an entire staff that needs training? Or perhaps you have an existing business and your entire staff needs updated canine first aid and safety training? 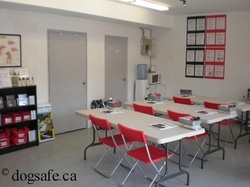 Many Dogsafe Instructors offer private group courses at their location or at your designated location. Please contact your local Dogsafe Authorized Instructor. Do you have a group of clients that are interested in learning canine first aid together? Why not organize a private Dogsafe course for your existing clients and customers? This is a great way to provide additional essential services to your existing client base, improve customer relations and increase revenue all at the same time. Please contact your local Dogsafe Authorized Instructor for details. Dogsafe is fast becoming the leader in canine first aid and safety training; people know and respect our name. Once you have successfully completed a minimum of the Dogsafe Canine First Aid 101 course, you may proudly display the Dogsafe Certified logo on your company website, brochures and business cards. Once you have successfully completed Dogsafe's Operation Find Fido 101™ workshop, you may proudly display the Operation Find Fido™ Certified jpeg logo. Both show your commitment to canine first aid and safety to prospective clients -- a real concern for today's dog owners. Join the high standards of other canine businesses who are already Dogsafe Certified and listed on our Find A Certified Dog Professional webpage. ​Have a dog business and graduated but not listed yet?